Archives for posts with tag: Chives. Hmm, I’m hungry, and I also want to listen to Nihal talking to Bhangra legend Jags Klimax on BBC Radio 1Xtra. I think I’ll just chop myself up some chives and turn the radio on… SWEET JESUS JOSEPH MARY AND HAILE SELASSIE!!! Those chives are going to have to wait, because this freak of nature has just wandered onto the chopping board. As you can see, it still has 8 legs, but if it’s going to continue to trespass in the land of the sharpened blade, that might not be the way for much longer. I’m actually quite surprised to see the pattern on it’s thorax. abdoman. arse-bone. Whatever that back bit is called. When I first saw it and asked for a pose for the camera I hadn’t noticed that at all. Only now I’ve got the photo uploaded is it obvious that it’s the same sort as that other huge one I had in the kitchen. In case you’re wondering, this definitely isn’t the same one. This one is smaller. 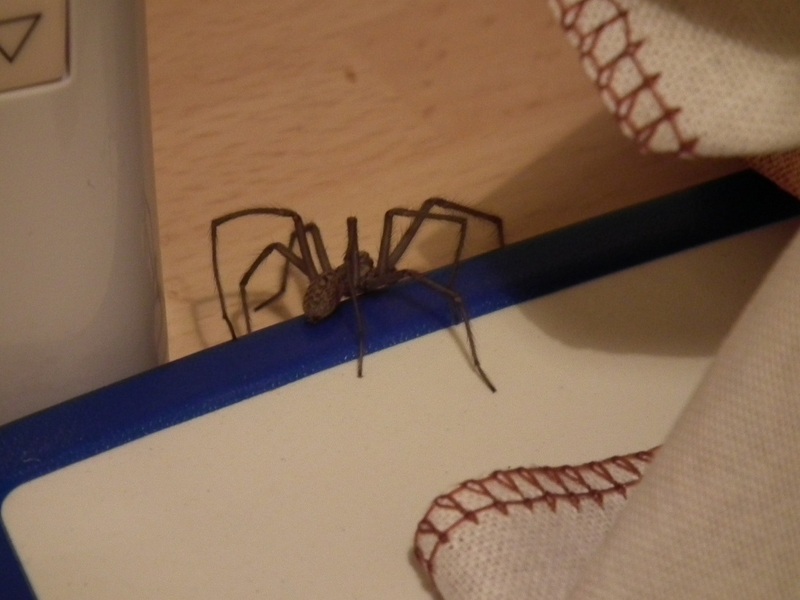 Even with it’s legs hunched up as opposed to stretched out, I could tell that it was smaller. It’s front bit, it’s fizzog, if you will, was also less evil and bitey looking. Scaryness rating: 8. Smaller than the previous patterned kitchen-dweller, but it’s proximity to my chives and it’s Bhangra-blocking activities next to my radio make this a much more viable threat to my sanity.